The Biosen series is the leading brand name in lactate threshold measurement for top class athletic sports institutes and professional sports teams. Biosen analyzers can be manufactured as single channel lactate systems or as dual channel systems that can measure glucose at the same time. Biosen uses a special chip sensor technology to deliver fast measurements with a high degree of accuracy at a low cost per test. Due to the long life of the sensor chip the system requires little maintenance, features such as the touch screen and large memory only add to the Biosen analyzer’s user-friendliness. An integrated barcode reader and printer are also available with most configurations, allowing entire teams of athletes to have multiple step-tests during training. 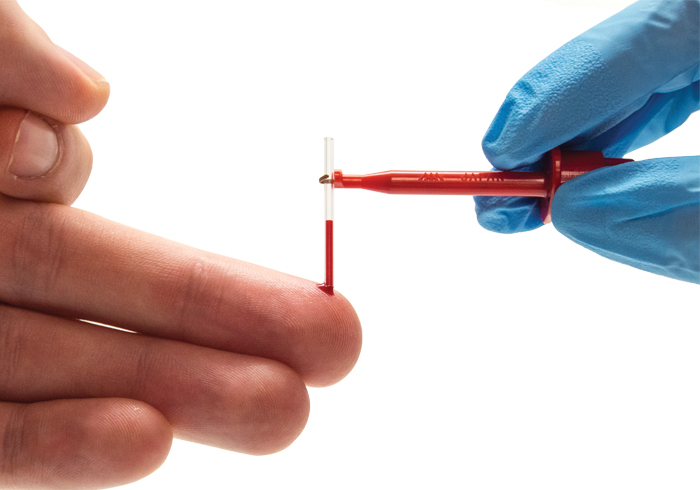 Biosen can test blood, plasma or serum to provide lactate and glucose values with excellent precision (less than 2% CV) over a wide measurement range. 1. Collect capillary blood sample. 2. Place capillary into cup and mix. 3. Result in 20-45 seconds. During endurance exercises such as long-distance running and cycling, when the demand for energy is high, lactate is produced faster than the ability of the tissues to remove it. As a result lactate concentration in the blood begins to rise. The use of a lactate analyzer helps coaches and athletes to determine optimum training programs, define training zones, and avoid inefficient training exercises. Intense training teaches the body to use lactate as a source of fuel on a par with the carbohydrates stored in muscle tissue and blood sugar. Athletes increase their lactate threshold by training harder, this means their blood lactate increases later and they can maintain a higher work-load. In fitness, sports, and cardio-rehabilitation measuring lactate is supportive to define training intensities for maximum fat catabolism, increases in endurance, and avoid critical over-exhaustion. Lactate is produced when the muscles use carbohydrates to create energy for exercise. The underlying metabolic process is the glycolysis. It happens continuously but increases when energy demand is high for a prolonged period of time and availability of oxygen to the cells is limited. Increased glycolysis produces hydrogen ions and lactate, and it's the hydrogen ions that cause pain, sore muscles, cramps and fatigue. The body protects itself by telling you: "I can't do this anymore". Regular endurance sports should only take place within the respective 'lactate steady-state' - a well-balanced relationship between lactate production and elimination. With higher exercise intensity the lactate level in the blood reaches the anaerobic threshold or the onset of rapid blood lactate accumulation. This point can be determined in step tests with increasing training intensity in defined intervals e.g. on a tread-mill, bicycle or in a field test. The higher the level of effort is when the rise of lactate indicates the anaerobic threshold the better is the performance status of the athlete. Intense training teaches the body to use lactate as a source of fuel on a par with the carbohydrates stored in muscle tissue and the sugar in blood. Athletes increase their lactate threshold by training which means their blood lactate increases later and at higher intensities. There are many uses of lactate in healthcare. Some of these are well established, for example lactate measurement in fitness and cardio training. As a world-leader in lactate, EKF has been closely involved in recently developed applications of lactate in obstetric medicine. Regular endurance exercise has many benefits for health and well-being. It has been proven to lower systolic and diastolic blood pressure, improve insulin sensitivity and lower HbA1c levels, lower triglycerides and increase HDL-cholesterol. Regular power exercise, meanwhile, can increase insulin sensitivity. The maximal fat oxidation rate is reached under long term aerobic conditions because this is when predominantly free fatty acids are used as the energy source. In contrast, under anaerobic conditions mainly carbohydrates are used for generating energy. The measurement of lactate during step tests reveals the shift from aerobic (oxygen dependent) to complementary anaerobic (non-oxygen dependent) metabolism. The knowledge of this ‘anaerobic threshold’ can be used for the definition of training intensities and conditions to achieve optimal fitness and weight reduction. Furthermore, lactate testing can support a secure and efficient training avoiding critical over-exhaustion. Lactate testing in the veterinary field works in a very similar way to the human application. Lactate measurements are carried out to determine the performance of racing animals like horses or dogs, to monitor organ dysfunction, inflammatory processes in critically ill animals or in a multitude of basic research applications. EKF's lactate analyzers, Biosen and Lactate Scout+, meet the demands of veterinary. A wide measurement range covers the typical values of different species. E.g. racing horses have a very high 'maxlass' (being the highest stable or balanced lactate level during exercise) of above 20 mmol/L, a level at which both devices deliver accurate results. The measurement of lactate on Biosen analyzers is based on an electrochemical principle. 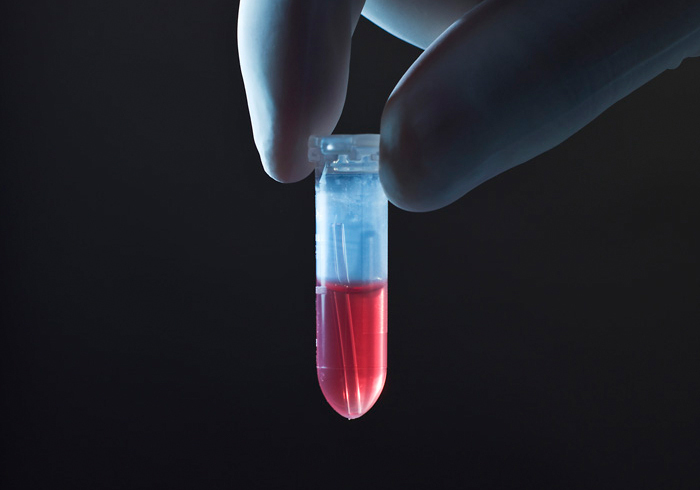 The sample is precisely taken up by the user with a 20 µl end-to-end capillary and transferred into the EKF safe-lock cup prefilled with 1 ml of hemolysis solution. The cup is then closed and gently shaken for mixture and hemolysis of the sample. After insertion into the analyser the sample is automatically taken up and moved to the sensor(s). Here the L-lactate contained in the sample, is converted enzymatically with the help of the immobilised enzyme glucose oxidase / lactate oxidase on the chip sensor. The H2O2 generated by the reaction is detected at the electrode. The amperometric signal (sensor current) is proportional to the glucose/lactate concentration in the sample. Do Biosen analyzers need to be calibrated? 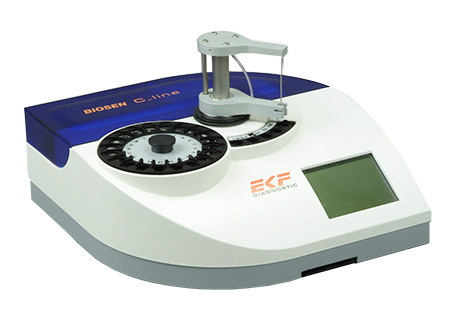 The calibration is performed automatically by the Biosen analyzer. The operator can choose from three different calibration modes: ‘at startup’, ‘periodic’ or ‘time account’. 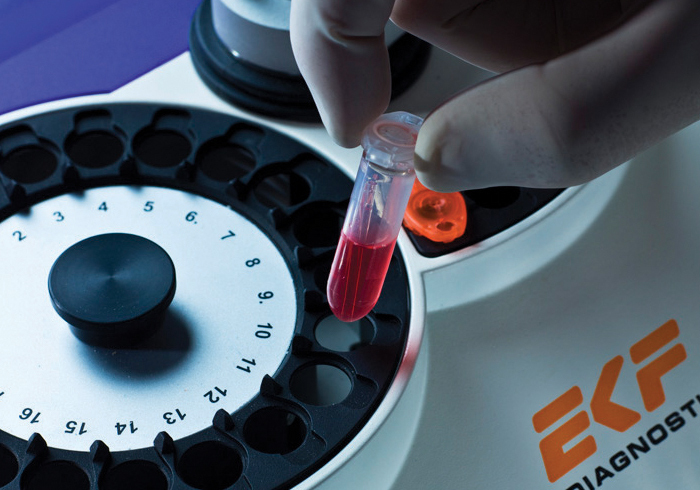 EKF Diagnostics provides a standard solution to calibrate the system for glucose and lactate testing. How many measurements can be taken on one sensor? 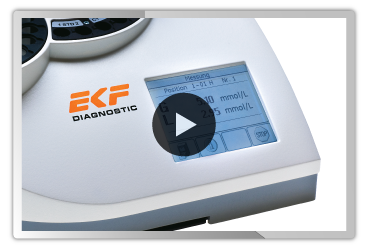 EKF Diagnostics guarantees that each sensor will last for 7,500 glucose measurements (or 60 days) or 6,000 lactate measurements (or 50 days). Biosen analyzers come with a warranty of one year from the date of shipping.